This article is based on a London Mathematical Society popular lecture given by David Tong, Professor of Theoretical Physics at the university of Cambridge. You can see a video of the lecture below. People often talk about the "unreasonable effectiveness of mathematics" — a phrase coined by the physicist Eugene Wigner in 1960 to capture the idea that mathematics describes the physical world far better than you'd expect from a mere human-made tool. Indeed, many physicists feel that mathematics expresses something deep about the nature of physical reality. Why do they feel that? And can physics return the favour? That mathematics should be useful in physics is no surprise. Whenever we need to measure, count, and understand patterns or relationships in the world, maths is an essential tool. What is surprising, however, is that even mathematics that has been developed for the pure pleasure of pure maths can prove to be uncannily useful in physics, sometimes a long time after it was first thought of. 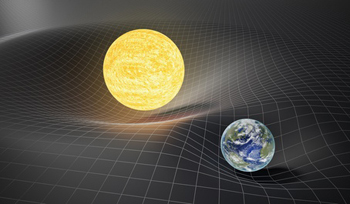 General relativity asserts that massive objects curve the fabric of spacetime. To formulate it Einstein used geometric notions of curvature developed by Riemann in the 19th century. A fascinating example is a particular geometric notion of curvature developed by the mathematician Bernhard Riemann in the 19th century. Riemann cared nothing about physics when he came up with his ideas, and he certainly did not predict the dramatic developments in physics that were to flow from Albert Einstein's pen at the beginning of the 20th century. This is just one example of the unintended usefulness of mathematics. Purely mathematical considerations continue to lead the way in modern physics, and they continue to prove impressively productive (see here to find out more). Once a mathematical description of a physical theory has been found, it is often surprisingly simple. This doesn't mean that the maths of physics is easy — far from it. It means that advances in physics don't come with ever more convoluted mathematics. Breakthroughs in physics happen when someone finds a new way of looking at a problem; a way that requires a mathematical framework that previously hadn't been considered for the purpose, or is completely new. Every single time such a new framework has been deployed in the history of physics, the simplest equation within it turned out to be the one that describes what is happening in our Universe. Einstein's general theory of relativity is again a case in point. Its central equation is given below. Even if you don't understand what its symbols mean, you have to admit that for a description of all large-scale structures and processes in the Universe, it's elegantly brief. If you would like to understand the equation in more detail, see this article. That’s an agreement to thirteen decimal places. In no other field of science do theory and experiment concord to such a spectacular extent. Can physics give something back? It can! Recent decades have seen an interesting new dynamic: ideas from physics have flowed across to mathematics and solved mathematical problems that had seemed completely inaccessible. A beautiful example comes from physicists’ favourite approach to understanding unknown objects. They bombard an object with particles (which they do understand) and from the way these particles scatter off infer properties of the object. That's exactly what happens in particle colliders like the LHC. 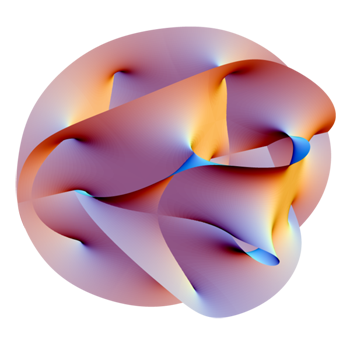 The Calabi-Yau manifold is one of the manifolds that benefited from the approach described here. To find out more about the Calabi-Yau manifold, see this article. Image: Lunch, CC BY-SA 2.5. Since the time of Riemann mathematicians have been interested in manifolds. These are geometrical objects that, viewed from close up, look exactly like the ordinary Euclidean space we learn about at school. Their overall structure can be much more complicated than the plane or 3D space, however. They can even have more than three dimensions. And because we can't draw pictures of such manifolds or make them out of paper mâché, there are many things about them that mathematicians still don't understand. This is where the scattering idea from physics comes in. Physicists allowed hypothetical particles, described by mathematical equations, to move around those abstract manifolds, allowing them to "feel" the space they were moving on. This proved particularly fruitful when they used hypothetical quantum particles, which can be in many places at once (see here), and the strings that replace the notion of particles in string theory. For example, strings enabled physicists to discover that certain manifolds come in pairs, a fact that had escaped mathematicians completely. The approach revolutionised geometry and answered questions in geometry that had been open for 100 years. So do maths and physics really enjoy a special relationship? Is nature inherently mathematical? Or are these examples down to the way we choose to, or have evolved to, look at the world around us. These are questions for philosophers, which perhaps will find answers in the future. I do not entirely disagree with the article but would like to point out that the apparent simplicity of mathematical formulae, like Einstein's field equations above, are to some extent illusory. Mathematics is a radical compression of logical and scientific language into a more economical set of conventional symbols, the meanings of which have evolved out of traditional use by specialized practitioners. Einstein is said to have called his summation notation his most significant contribution. I'm sure he said this tongue-in-cheek but it points to this important function of math practice. To the untrained, the field equations may appear simple, but they are completely mystifying because the layman does not possess the reams of background knowledge (which is not simple) to interpret the meaning of the symbols. These equations appear at once simple and meaningful only to the practiced expert who is able to implicitly expand their traditional symbols into the full and complex language of science and logic.